ValleyCats are your 2018 Stedler Division Champions! 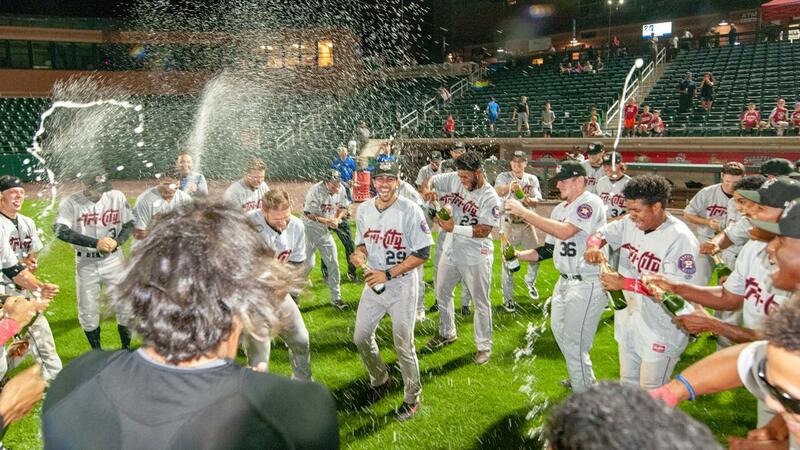 The Tri-City ValleyCats have captured the 2018 Stedler Division title, punching their ticket to the New York-Penn League playoffs with a 3-2 win over the Lowell Spinners on Thursday night. It's the 'Cats eighth Stedler Division title in their 17 year history. The narrow victory, coupled with a loss by the Vermont Lake Monsters, gave the ValleyCats an insurmountable 4.5-game lead in the Stedler division with four games left to be played in the regular season. Thursday night's win was the ValleyCats' second straight over the Lowell Spinners and it was again powered by excellent pitching. One day after they yielded just three hits in a shutout win, the 'Cats again gave up only three hits in their division-clinching win. Manny Ramirez started the game in his ValleyCats debut with three hitless innings, before Matt Ruppenthal gave up the Tri-City's only two runs in the fourth. After Ruppenthal recorded one out in the fourth, he was then replaced by Nivaldo Rodriguez, who blazed through the seventh inning, giving up just one hit to qualify for his fourth win of the season. Joey Gonzalez pitched a perfect eighth inning in his ValleyCats debut for a hold, before Jacob Billingsley polished off the game with a scoreless ninth inning to earn the first save of his professional career. Offensively, the ValleyCats garnered just five hits, but they made the most of them by tallying one run each in the sixth, seventh and eighth innings. Oscar Campos used a single to bring home Carlos Machado with the 'Cats' first run in the sixth, cutting Lowell's lead to 2-1. Luis Encarnacion then smacked his team-leading ninth homer of the season out of the park to tie the game in the seventh. Campos brought home the ValleyCats' last run on a groundout that again scored Carlos Machado with the game's decisive run in the eighth inning. The win makes the ValleyCats the first team in the New York-Penn League to have clinched their respective division outright. With four games left in the regular season, the ValleyCats' opponent in the first round of the playoffs is still to be determined. The New York-Penn League playoffs will begin on Wednesday, September 5. The 'Cats will either host Game 1 at Joseph L. Bruno Stadium on 9/5, or Game 2 and Game 3 (if necessary) on 9/6-9/7. The series will be best of three. ValleyCats playoff tickets are on sale now by logging on to tcvalleycats.com, calling 518-629-CATS (2287), or by visiting the Joseph L. Bruno Stadium box office. Tickets range from $7.50 to $12.50.